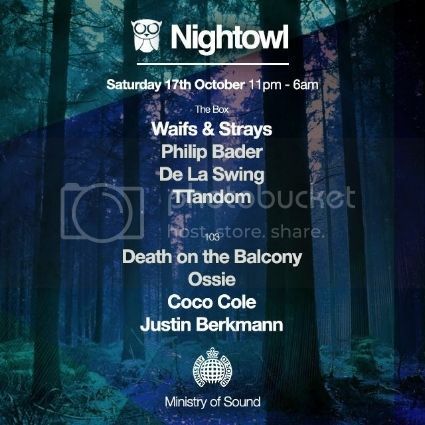 Operating in London, Bristol, Brighton and Reading, Nightowl is responsible for bringing some of the biggest names in House and Techno to the masses, and this night promises to be no different. Our headliner for the night will be Amos Nelson, aka Waifs & Strays - a Bristol based DJ and Producer who has exploded across the House and Techno scene in recent years. With releases on Kerri Chandler's Mad Tech Records and Luke Solomun's Classic imprint, there's a reason why he's at the very top of his game, and we can't wait to welcome him back to the club! Next up on the bill, we have Berlin’s own Philip Bader whose productions have seen releases on Monika Kruse’s label Electric Avenue as well as Kindisch, Saved and Moon Harbour. His style is characterized by deep minimalist Techno influences and creatively placed vocals, often sampling his own voice, while his DJ sets are like his productions: deep, playful and powerful. Over the past 5 years De La Swing has shared turntables with the likes of Marco Carola, Loco Dice and Richie Hawtin, to name but a few. Since 2010, he has been a cornerstone of Elrow, the after-hours party based in the ever growing electronic hub of Barcelona. He’s sure to bring the sunshine vibes to Elephant and Castle when he makes his debut on October 17th!